Here's the story. So, I go to the Goodwill Outlet. 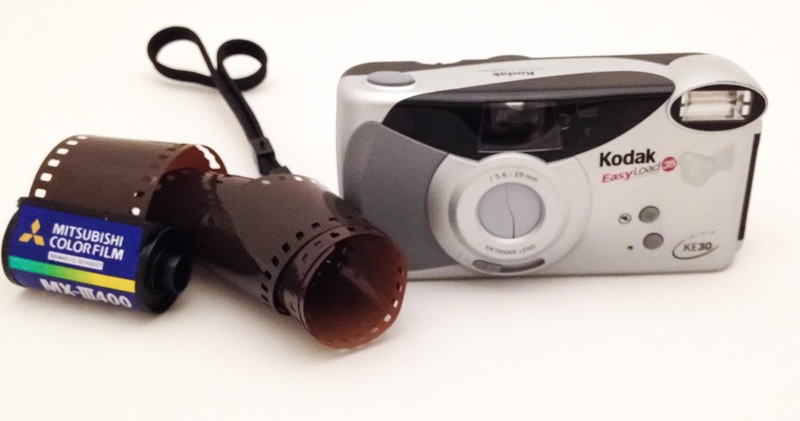 This Kodak Easy Load KE30 is sitting there all lonely asking me to buy it. OK I say, for less than 25 cents, you're mine. I take this cute little beauty home. I'm a good guy that way. I give her 2 AAA batteries. Thanks, Steve, she's telling me. I go out Sunday and want to shoot a roll during a model shoot in studio. Yes, yes, I know, model shoot in studio, and you're whipping out a point & shoot film camera for BTS photos. But oh no, this camera says NO, I'm the only cute one here, so she revolts. Can't get the film to load correctly, and when I finally think I have it - it doesn't advance. I open the film door to fix it, and the film auto rewinds all the way back into the film can. One roll dead. No problems my precious, I load it with another roll, and after work tonight I shoot 12 images (see there is a reason I bought a brick of 12 image rolls on eBay). I'm thinking this camera is pretty sweet. Easy, no dramas, just point & shoot. OK, so I'm finished with # 12 and the camera makes this sound like the film is rewinding. I think, cool, I'm at the end. I then open the film door, and the film hasn't rewound back into the container. I have to yank it out and you see the results. Argh, I forgot to push the little button that rewinds the film....face palm. I'll give it one more try this week, but if I can't get the camera to load and rewind correctly - trash bin for you.